One of appliances that might cause small problems is the washing mashine. It uses a lot of energy to heat the water, and also some for the washing cycle, and spinning. And you can save a most of this energy if you get a device called Wonderwash. The idea behind this device is as simple as it can get. You make some warm water on your stove (probably not electric stove, as you’re off-grid), then insert all your dirty clothes to the Wonderwash, add the warm water (the temperature depends on the fabric your clothes are made from). You add the laundry detergent, install a tight lid, and let the physics do some work. The Wonderwash is a pressure device, and the pressure is caused from the warm water. The water causes the air to become warmer, and thus increase it’s pressure a bit. This increased pressure forces the water and detergent deep into the fabric, which makes it a lot easier to remove all the dirt and stains. Then you start turning the Wonderwash (it’s hand-cranked). Supposedly it takes only 1-2 minutes to make your clothes clean. Then you pour the water out, and replace it with cold water for rinsing. Or you can take the clotes out and rinse them manually. 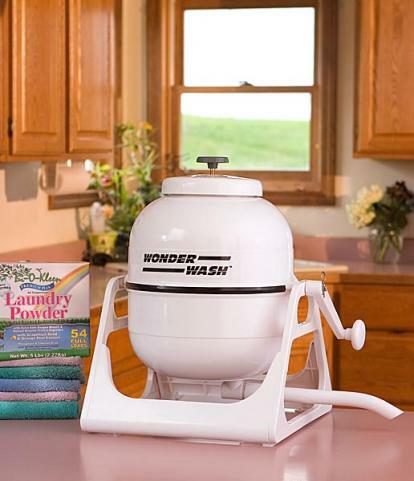 Using the Wonderwash allows you to save the energy that would be used by the washing mashine’s motor. Of course you would have to use some energy to heat the water, but you can just take warm water from a kettle you warm on the wood stove. Oh, and another thing. All the conventional washing mashines spin the clothes after they’re rinsed. Because of that, they become dry much more faster. So if you use Wonderwash, you would have to give your clothes a couple extra hours to dry. If you’re worried that operating this device may be difficult, check the video below. It clearly shows that even a kid can wash clothes using it. One Response for "Wonderwash – a good idea for off-grid washing"
I had the Wonder Washer, but didn’t like it. It was okay for clothing that didn’t get very dirty. But did a horrible job on my husband’s clothes since he was working outside and got very dirty digging out stumps and other dirty jobs. Instead we use the Mobile Washer, which is more like a glorified plunger used in a bucket. He still hand scrubs his jeans though. We do have a brand new energy efficient washer waiting for a our water to be hooked up to our house. Then we hopefully, can use that. It would not work without the pressure of water coming through the pipes.